Founded in 1885, Vicente Gandia is just 90km from Valencia city in the DO of Utiel-Requena. One of Valencia’s largest wineries, it is managed by the fourth generation of the Gandia family. You’ll be charmed with the Finca Hoya de Cadenas winery where it’s wine cellar is now an art gallery. You won’t find canvases here, it’s the wine barrels themselves that have been painted and decorated by famous Spanish artists such as Javier Mariscal, Miquel Navarro, Carmen Calvo, Uiso Alemany and José Sanleón. You can see images of the individual wine barrels on the winery’s Pinterest page here. And it doesn’t end there. The winery’s bottle labels are inspired by the artists’ designs. Take for example Mariscal’s artwork which features on their label of the ‘El Miracle‘ red wine. (You probably know that he is one of Spain’s best loved artists and designers but did you know he is from Valencia?) Wouldn’t it make a lovely gift? Not only is the label charming but the wine inside has been awarded 90 points by both Robert Parker and the Peñín guide. While visiting the winery, in addition to examining the art, you’ll also get to see the wine-making process inside the modern facilities that date from 2001 and you can even travel through the estate by train. If you want to enjoy the views from up high, you can take a balloon ride over the estate which is 490 acres in size. We’ve all been in the large modern wineries where the wine may be amazing but it’s hard to get around the fact that you are often looking at large industrial vats. 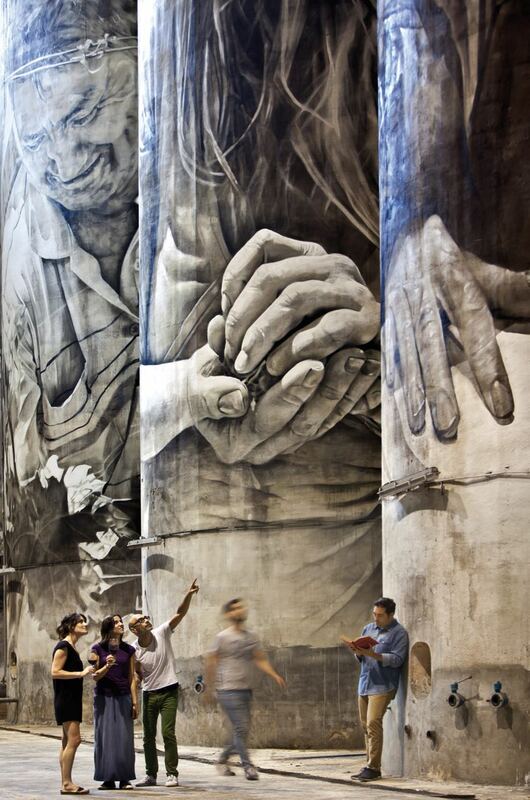 Not so in the wonderful winery of Solar de Samaniego in Laguardia (Rioja Alavesa) where Australian mural artist Guido Van Helten has produced a startlingly beautiful body of art in what is known as the Cathedral of Wine. You can see the making of this art-work in this short video. Seven murals in total, of more than 13 metres in height were painted by the Brisbane artist back in 2016. This was Van Helten’s first indoor commission and using the theme ‘Drinking between the Lines’ – Beber Entre Lineas – the artist depicts the fusion between the culture of wine-making and writing. It makes sense that the winery continues to honour the tradition of literature because Felix Samaniego, a famous Spanish writer of fables in the 18th century, came from Laguardia and owned one of the vineyards that’s now part of the Solar de Samaniego. A visit to the winery also includes a tour of the wine-making facilities and a tasting of its local Riojas – you may also have an opportunity to taste the wines from its sister winery, Duron in the Ribera de Duero DO. All the wineries sell some of their stock but this winery has a wine club or ‘cofradia’ so you can order wines direct from the winery at any time, consult with the winery’s technical specialists, enjoy special events and tastings and even make use of its label personalisation service. If you really enjoyed Guido’s designs, you can purchase a limited edition set of seven magnums which bear his designs! 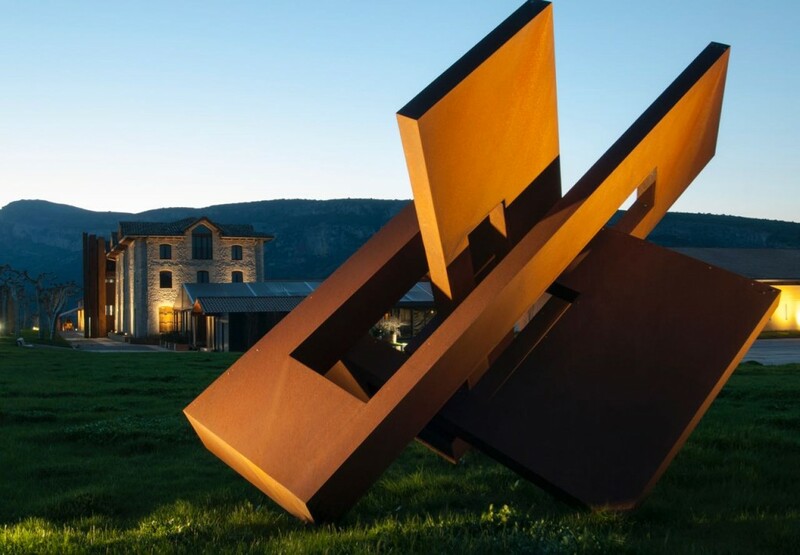 If you are becoming dazzled by the number of wineries with art in Spain, it may help to tell you that this is perhaps the best-known art collection exhibited in a winery in the country. In addition to a tour of this wonderful old winery in the centre of Jerez, you will enjoy the tasting of its aged-sherries and brandies. Although Bodegas Tradicion is technically a very new player in the market (it was founded in 1998), Joaquín Rivero was a descendant of the oldest sherry house J.M. Rivero, dated 1650, which had been a supplier of sherry to the Spanish and Portuguese royal crowns. 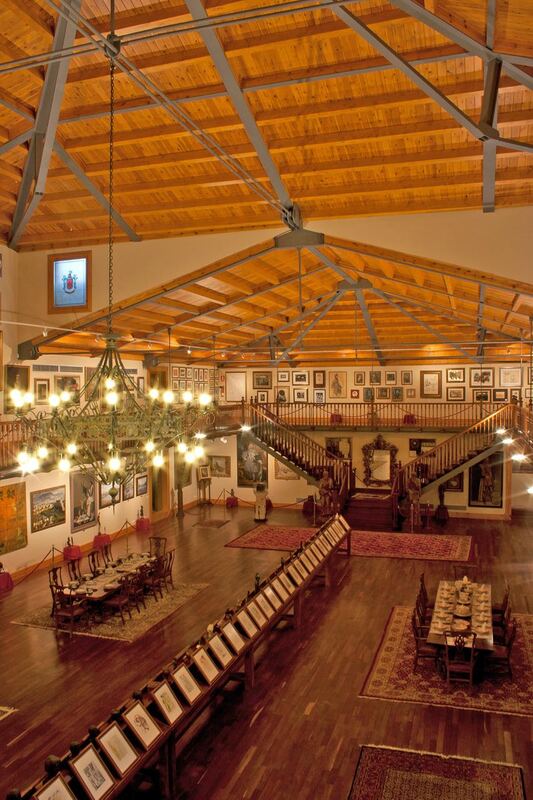 In addition to setting up the winery, Joaquín Rivero was also an art collector, and his 300 works that date from the 15th to the 19th century were first exhibited in the winery in 2006. 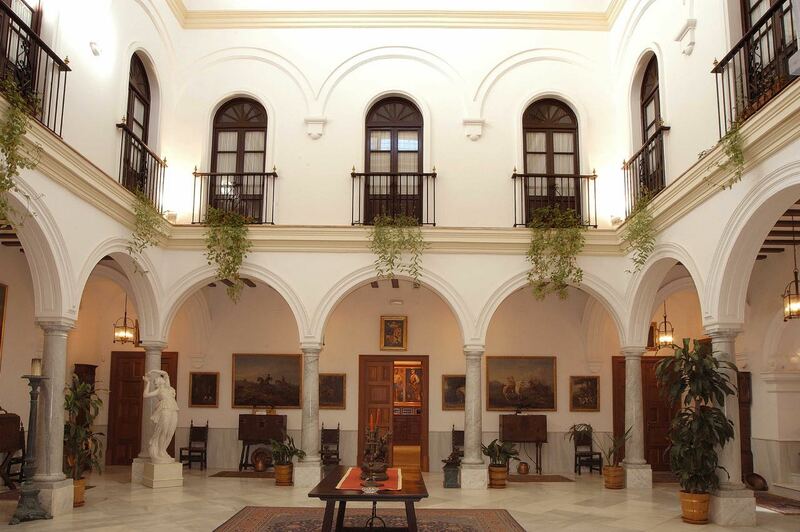 As you enjoy a taste of the winery’s Oloroso, Amontillado and Palo Cortado, you will also get to experience one of the best private art collections in Andalusia with artwork that includes Zurbarán, Velázquez, Goya and El Greco. Jerez is home to not one but two wonderful spaces for art and sherry. Just 7km outside the city, you’ll find the Grupo Estevez winery where you can experience Suite Vollard, one of the most important print collections by Picasso – often referred to as the precursor to Guernica. Inside the winery, you’ll see 97 prints from the collection plus three portraits of Ambroise Vollard who was Picasso’s art dealer and commissioned these works that were created from 1930 to 1936. 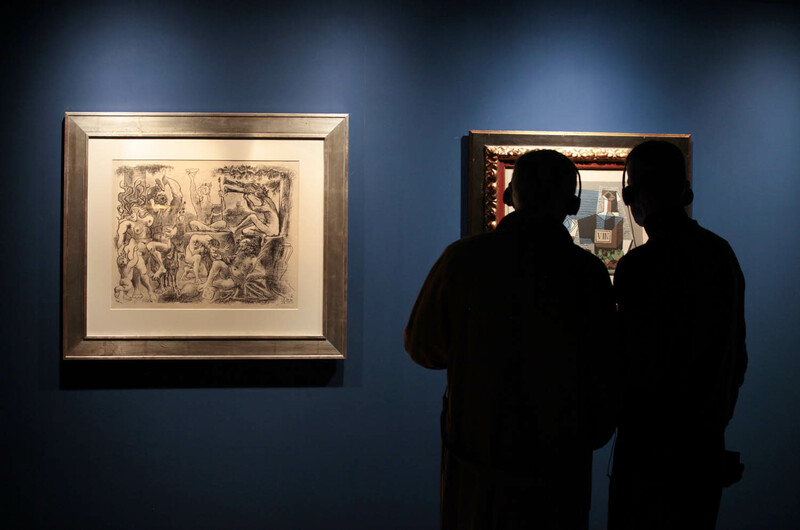 The four themes to the works are Minotaurs (man-beast), the Battle of Love, Rembrandt and the Sculptor’s studio. The history of the collection is as interesting as the work itself and you can read about it and see some of the etchings in detail here and here. This collection was purchased in 2002 to bring art to the forefront of this sherry winery where you’ll also find works on show by Dalí, Botero, Miró, Tàpies and Chillida. In addition to the art collection, the sherry tasting and a tour of its facilities, you should also visit the winery’s stables where impressive Spanish thoroughbreds are raised and the Carriage Museum is also worth a peek. 8km from Pamplona in Etxauri, Navarre, you’ll find Bodega Otazu and its stunning mansion dating from the 1840s (although the present owners only took up occupancy in 1994). It was awarded Pago Appellation status in 2009 which is the equivalent of grand cru in Spain’s wine classification system and there are only 13 others with this status in Spain. As you tour the facilities, both inside and out, you’ll come across some wonderful sculptures by the likes of Anish Kapoor, Xavier Mascaró and Manolo Valdes. In fact, the Ariadna piece created by Valdes appears on many of its bottles such as the Otazu Premium Cuvee here. Inside you’ll find the art continues. Fundación Otazu, responsible for what is the Kablanc collection of art, has recently begun its own biennale for contemporary art back in 2016 – inviting four artists to participate – with the top award going to the Chilean-born Alfredo Jaar who had created a piece of sculpture reflecting the four types of wine Otazu produces. In addition to the standard tour which includes a tasting of two wines, we have to say we like the more exclusive wine-blending session where you and your group get to blend your own wines and the best wine from that group is set aside for ageing and is bottled and delivered to you. If that sounds too much like hard work, you can take the scenic tour that visits the 12th century Romanesque chapel, the 14th century tower and the palace from the 16th century. Not only is Vivanco an accomplished and high-quality wine-producer but it was one of the early pioneers in investing in its ‘visitor experience’. Back in 2004, it opened up a museum and gardens – spreading out over 4,000 square metres – that examines the relationship between mankind and wine. 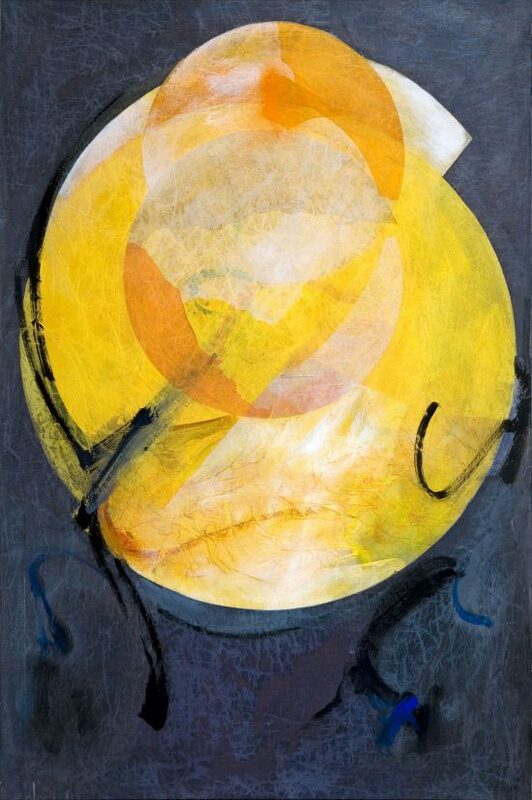 In addition to displaying the tools of the trade and outlining the history of wine-making, Vivanco also presents artworks that illustrate how wine has inspired artists with pieces by Pablo Picasso, Sorolla, Joan Miró and Juan Gris to name but a few. 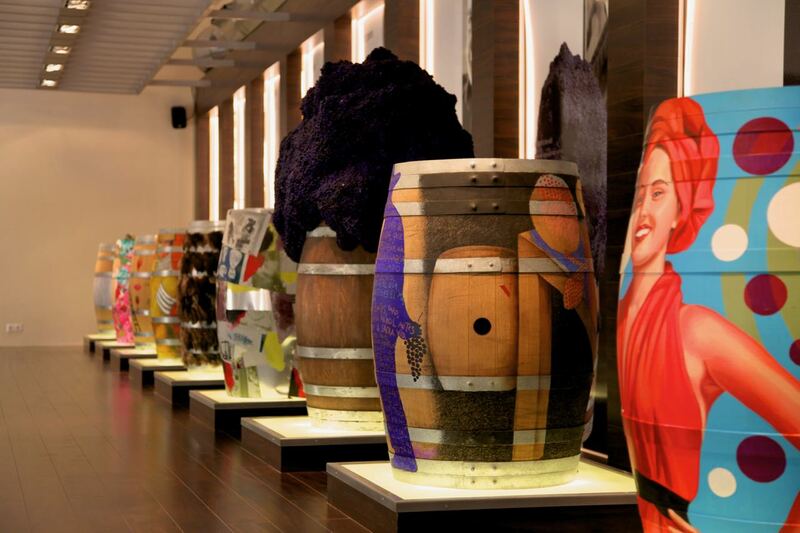 It’s hard to find a better example of a winery with art in Spain. After you’ve enjoyed the artwork, relax in the Garden of Bacchus, a collection of grapevines which boasts more than 220 varieties from around the world. Don’t forget the wines either – which are intrinsically linked to the artworks as you can see in the video about Miró here. Why not bring a bit of Miró home with you by purchasing a box before you leave? Many of its wines have won awards and rank highly in the international rankings. One of the newer wineries in the Ribero del Duero DO, and part of the extensive Faustino Group, is Portia winery where you’ll find ‘a pairing’ of wine and art. Inside the inspiring space designed by Norman Foster for which he won a RIBA award for architecture in 2011, you’ll find the exhibition of artwork curated by Arsfundum, a private investment initiative established back in 2005 that represents 80 Spanish and Portuguese artists. The pieces range from video to painting and photography and were selected to perfectly compliment the stunning surroundings. Unlike most of the other permanent exhibitions, this exhibition is temporary so please check that it is still on show before heading out for your visit. If you have driven a distance to get here and you find yourself peckish, you’ll find lots of traditional restaurants in the countryside but we think you should check out the winery’s own gastrobar. We are also fans of the wine itself so leave lots of room in the boot of the car for a box of the Triennia Portia which was awarded 92 points by the Wine Enthusiast magazine. In the town of Rueda, where wine has been made since the 11th century, you’ll find Bodegas Mocén where wine has been produced since the 1400s. It’s current operation dates from 1988 when a well-known Madrid restauranteur, José Luis Ruiz Solaguren, who the owner of the successful ‘Jose Luis’ chain of restaurants in Madrid city was in the market for a winery. Jose Luis liked what he saw in Rueda and set to work restoring the vineyard and the winery with its incredible cellars that are over 500 years old and run 25 metres deep and for about 4km underground! His extensive library is full of unusual and exceptional manuscripts and it was opened in 2000 by Camilo José Cela, the Nobel Prize-winning writer. But his art collection is perhaps the jewel in the crown with close to 900 works of art on show with headline names such as Dalí and Picasso capturing most of the attention. A unique experience of a winery with great history and character together with literature and art in the heart of old Castile. In 1992, Enate commenced its contemporary art collection at the same time as the winery began its operations, and today, each of its Somontano wines has been associated with a Spanish or international painter, who produces an artwork for the label. The well-known Spanish painter, Antonio Saura, was the first artist whose work was chosen to adorn the winery’s Chardonnay Barrica. Names like Antoni Tapies, Eduardo Chillida and Eduardo Arroyo have since followed and many other painters form part of the group of artists who have worked with Enate. We’ve published one of our favourites above – by Salvador Victoria Marz and you can find your own personal favourite among the artists online and at the winery itself. We also admire how the winery supports young artists through its scholarship programme and how new Enate wines are usually launched at galleries, for example, the Thyssen Bornemisza Museum, Tàpies Foundation in Barcelona and IVAM in Valencia. You can enjoy the 100+ original works by all these well-known painters in the winery’s exhibition hall while taking one of the many tours – all of which are interesting. We particularly like the in-depth tour of the vineyards themselves that includes a wine tasting with nibbles amongst the vines. There are also themed tastings including a wine and chocolate tasting. If you can’t make it to the vines or the winery, do check out the labels online such as this one by Antonio Saura. 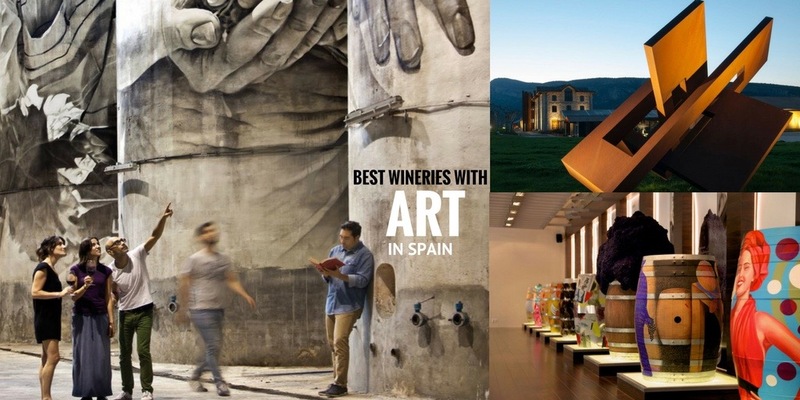 Still want more wineries with art in Spain? If wine-labelling can be considered a form of art then we feel safe suggesting a visit to the extremely tasty sparkling cava-producer, Gramona, and its most elegant of wineries. Gramona is well-known for its collaboration with artists (see the limited-edition series here) to raise money for a local children’s charity. 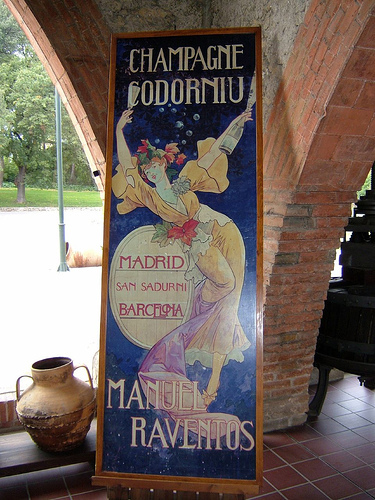 Another even better-known cava winery, Codorniu is also recommended for a visit – not just to experience its stunning Modernist architecture designed by the great Puig i Cadafalch – but also to see the original posters and signage created by the big names of the day including Ramón Casas, the painter and graphic designer who financed the mythical El Quatre Gats in Barcelona. If you can’t get to the bodega anytime soon, you can examine some of the gorgeous posters by Casas here and see more of his work at the Museum of Modernisme in Barcelona also. If you want to have a little creative fun with art and wine, perhaps you should look up a Wine & Painting or Paint ‘n’ Sip event that take place in Madrid and Barcelona? The scheduled events are usually for over-18s but if you are travelling with a family group, you can arrange a private class. If you’re not familiar with the evenings which are very popular in the US, the structure is generally as follows. You pre-book a slot on an evening which can take place in an art studio or in a private room in a bar or restaurant. Upon arrival, you are provided with an easel, paper, canvas or board and paints plus a helpful apron to keep yourself reasonably paint-free. And some wine! The artist leading the session will have selected a painting or a scene which each of you attending will reproduce (with assistance if required) throughout the evening. As you work you can sip on your glass of red, white or bubbly and there are generally breaks planned when you get a chance to talk and mingle with the others at the event. When the class is over you get to take your new artwork home with you. To date, we see these events take place in Madrid and Barcelona although we’d be happy to schedule a private session for you and your travelling party in another city or perhaps even in a wine-bar or winery. Get in touch if you would like us to incorporate that into a fully planned itinerary for you! In the meantime, we hope you’ve enjoyed these wineries with art in Spain. Why not have a look at our other posts on wineries in Spain and Portugal? Posted in Food & Drink, Museums & Galleries, Wineries and tagged art, bodegas, exhibitions, murals, Museums & Galleries, Spain, wineries.